Natural cat breeds are distinguished beauties that evolved unfettered by human intervention! The natural breed cats have been popular throughout the ages. These are distinctive breeds that have naturally evolved over generations of inbreeding. They have had little to no assistance from humans and they are most often associated with specific geographical locations. Many of these domestic cats are steeped in romantic tradition and were often highly esteemed throughout history. Some sport beautiful thick coats, others have sleek elegant forms, and each has its unique cat behaviors. Though each natural cat breed has its unique characteristics, they are still favorites today. The species that all domestic cats belong in is Felis catus. There are over a hundred various breeds of cats that fall under this species and more than 70 are recognized by particular cat registries. The term "cat breed" relates to the ancestry or lineage of a cat. To belong to the natural cat breeds, a cat must "breed true" for the traits that define the breed. They will pass on particular biological traits to their progeny when bred to a mate of the same breed that is also true breeding. The list of cat breeds below includes many of the popular natural breed cats. Each cat guide provides the history and background of the natural cat breed along with a description, care, and a picture. To own a cat is a great pleasure and extraordinary experience indeed. Just recently, in the mid-1980's, cats have surpassed dogs as the most popular pet in the United States! Dogs are still kept in more households overall, however the number of cats being kept as pets is higher than the number of dogs! A brief history of where the cat came from begins approximately 60 million years ago. The Miacids (Miacidae) appeared on Earth at this time and they are the ancestors of all modern carnivores, including bears, tigers, and dogs. About 54 million years ago the first true felids were born, and 50 million years ago the cats first direct ancestor – Dinictis evolved. This feline spread rapidly and widely from where it originated, was lynx-sized, and was a very ferocious predator for it's time.The saber-tooths came next around 25-35 million years ago, and the first true cat, Proailurus also showed up somewhere around this time. The Proailurus was small and leopard-like, and probably spent a lot of it's time hanging out in trees. 20 million years ago the first "modern" felines appeared. Domestication of cats must have started at least 8,000 years ago. This is indicated by a cat jawbone found on the island of Cyprus in 1983, which dates back to about 6000 B.C. The cat must have been brought to the island by boat, and it only makes sense the cat must have been friendly for the people to have taken it. Somewhere between 7000 to 5000 B.C. In Northern Africa, a few small, tabby-striped wild felines arrived in human settlements. These were the most adaptable African wildcats, and the ones that started the process of domestication. Soon afterwards, the Felis libyca turned up in the Nile River Valley in Northeast Africa and became the best pest killers on the farm lands and in the food storage areas. Before cats, they would use weasels, but weasels were largely untameable, and African domestic cats were quickly taken on instead. This began the domestication of Felis silvestris libyca. which was during the Agricultural Revolution in the New Stone Age/Neolithic period. Later on, cats were used as pest killers on ships as well. The first records of domesticated cats is from about 3000 to 1450 B.C. The records include drawings and paintings of cats wearing collars and being tied to chairs that they were playing under. In 950 B.C., the cat-headed goddess, Bast, was born, and cats were worshiped. It was strictly forbidden to export cats anywhere out of Egypt, but by 900 B.C. Cats were being smuggles into Greece, Italy, and elsewhere. China had cats by 500 B.C. And India by 100 B.C. Persia wound up with them around 400 or 500 A.D. And the British Isles found them by 900 A.D. The native wildcat Felis silvestris silvestris was on the British Isles at this time and crossbreeding began. Although cats were seen as good and helpful animals throughout this time, it did not last forever. In 1200 A.D., cats were cast as a symbol of the devil and of paganism by the Catholic church in Europe. Cat worshipers were burned as witches and cats were burned along with them as their familiars. After the Black Death (the bubonic and pneumonic plagues) swept through Europe, there was major social change and cats started to become tolerated somewhat again. They weren't in a revered status, however, and still were tortured and killed in massive numbers during rituals and festivals. From the earliest known associations between cats and humans, it appears that domestic cats "selected" themselves for relationships with humans. The most adaptable and tamest cats would be the ones that hung around humans and they would therefore breed amongst themselves. This would encourage their offspring to also be tame and adaptable. This process is called neotenization. Overall, humans have had very little impact on the behavior and anatomy of domestic cats, unlike with dogs and most farm animals. They almost all share similarities with their wild ancestors (the African Wildcats). There are three main differences in modern domestic cats from their wild ancestors and from modern wild cats. The first being their breeding rate – a domestic cat can breed up to three times a year with no problems, whereas wild cats generally only have one breeding season each year. The second difference is their size – modern domestic cats are much smaller than most wild cats and their ancestors. This may have been a trait selected by humans, making them easier to handle, but there is no concrete evidence as to why this is. The last difference is that modern domestic cats are more "juvenile" than their wild counterparts. They seem to be in a constant state of kittenhood and view their human companions as their surrogate parents. The age that brought back a respect and love for cats was really the Victorian Age during the 19th century. Queen Victoria herself owned cats and British artist Louis Wain portrayed cats through his art to children as friendly and intelligent companions. The 20th century brought about even better outcomes for cats. Advances in technology and medicine also brought about good results for the car of cats. Study of cat behavior, psychology, and physiology brought about greater understanding of cats and many new innovative products came about that improved the lives of cats. These included the first canned cat foods in the 1920's and 1930's, and packaged cat litter in 1947 by Edward Lowe. Another breakthrough was realizing how important the amino acid taurine was to cats. In 1978 taurine was added to cat food and has since saved millions of cats lives. Regarding socialization, Eileen Karsh, PhD, demonstrated that kittens that were frequently handled between 3-14 weeks old adapted much better to humans than those that were not handled until later. Breeds are defined by cat registries, and the natural cat breeds are well established. Registries determine which traits define a breed, and also which traits that are especially valued or shunned. A few of the feline organizations that register cats are the Cat Fanciers' Association (CFA), the American Cat Fanciers' Association (ACFA), and the The International Cat Association (TICA). If you want to see a pedigreed cat, cat shows are the place to go. Pedigreed cats that are accepted into the shows must conform to their breed's standards, which usually include distinguishing features like their overall look, personality, or body type. Only about 3% of owned cats are pedigreed. 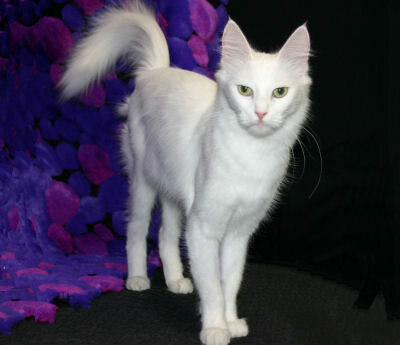 Natural cat breeds are some of the most popular pedigreed cats. Besides the natural cats, you can find beautiful pedigreed cats that are Hybrid Cat Breeds, Cat Breed Mutations, and Exotic Cats. Designer cats can belong to any of these three breed groups, but are never natural cat breed cats. The term "designer cats" are those bred for particular stunning traits, like dwarf cats, jungle hybrids or hairless cats, and they are usually developed for a particular market. Designer cats are relatively new, emerging breeds. You may see designer cats making their appearance at some cat shows, but many do not yet have a recognized status with cat registries. The first cat show ever recorded was in Winchester, Southern England in 1598, which gave prizes for the best ratter and mouser. By the second half of the 19th century, very serious, competitive cat showing was underway. The first major cat show was on July 13th, 1871 at the Crystal Palace in London. A total of 170 cats were shown, and this was the first time that cats were given standards and classes. In 1887 the National Cat Club was formed. Today, there are at least 65 cat shows a year in Britain and at least 400 in the U.S. The biggest modern cat show is the National Cat Show in London that takes place every December.